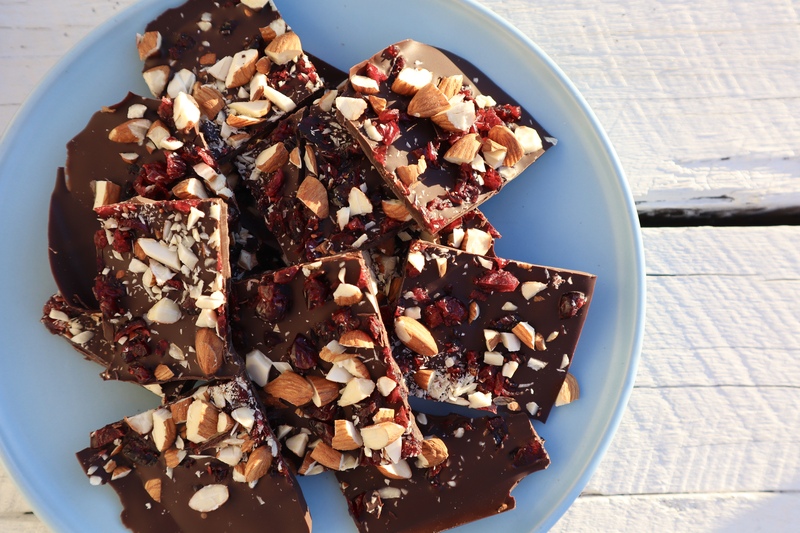 We are huge fans of chocolate bark here at ELE as it is so very simple to make, uses minimal ingredients but tastes delicious and is lovely to give as a gift. This version is packed full of antioxidants – dark chocolate, dried cranberries and almonds – making it almost a health food! While that may be a claim too far, it really is delicious and as healthy as chocolate is going to get. Click here to watch us make this recipe. To make, melt the dark chocolate in a heatproof metal bowl over a saucepan of simmering water. Once fully melted spoon the chocolate on to a sheet of baking paper on a tray and using either a spatula or a spoon spread the chocolate out until the bark is about 1/4 of an inch thick. While the chocolate is still soft top with the cranberries and almonds. Place in fridge for 1-2 hours until the chocolate is fully set. Once set, chop in to 2 x 3 inch pieces. Serve and enjoy! ELE top tip – this chocolate bark is perfect to give as a gift at this time of the year – simply wrap it in clear cellophane and tie it with a pretty ribbon and add a gift card. Love chocolate bark? Click here for our Pretzel and Peanut Chocolate Bark and here for our Dark Chocolate, Pistachio, Almond and Sea Salt Bark recipe. To watch us make this recipe click here. These look delicious! I may have to try them for myself!